Because I consider myself a 90% dietary vegan, this challenge was near to my heart. I cook only vegan at home, unless it’s the rare occasion when we eat something made with cheese—or the even rarer occasion that we have salmon (the only meat we will eat). But if we’re vegans, how are we able to eat cheese or fish on occasion, you ask? Simply put, we do our best to be “flexitarian”—a term we have adopted to describe our very occasional non-vegan habits when we are invited to someone’s home or find ourselves at an outing sans vegan options. As flexitarians, we go with the flow and do our best to stay as close to vegan as possible. With that said, I’m guessing you’re thinking this wasn’t much of a challenge for me, but I’m always up for finding new and interesting ways to change a non-vegan dish into a vegan one! Also, I have only been eating a plant-based diet for about three years now. That means there were many years of eating…well, mostly everything. Growing up, some of my favorite foods were chicken and dumplings and banana pudding. These—along with a few of my other favorite dishes—were hard to let go of at first, but I’ve really worked through learning new options to make my old favorites my new favorites again. Making comfort foods into vegan dishes isn’t always as simple as swapping things out, but it has been fun learning about new ingredients and techniques that allow me to really enjoy plant-based cooking and baking. 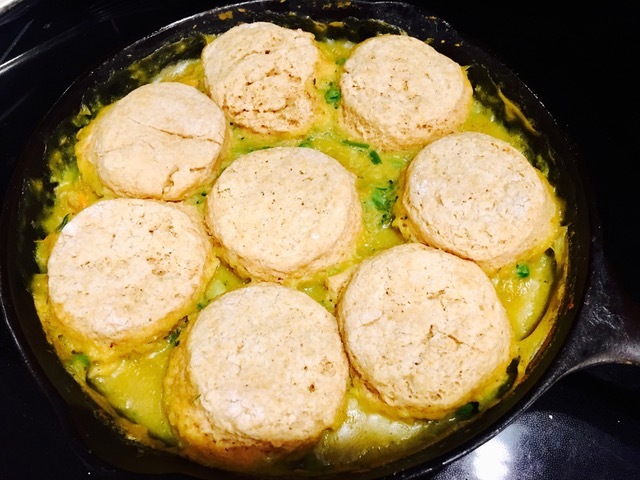 As I mentioned, chicken and dumplings is one of my old favorites, so I have revitalized it into a plant-based recipe that I’m going to share with you. This recipe also works to update the basic idea of dumplings; I prefer a nice, soft biscuit consistency. Some may frown upon that, but I’m willing to take the heat! It’s one of the best comfort food-style vegan dishes I’ve developed yet! Depending on how much I make for dinner, I like to use a cast iron skillet or a nice, big Dutch oven. In the picture above, I made the dish in a cast-iron skillet, and I used more turmeric. In the version below, I used the Dutch oven and added more veggies and less turmeric. The biscuits are a drop-biscuit version just as in the recipe at the end of this post. The rest of the week was spent learning to make smoothie bowls for breakfast, sometimes breakfast-for-dinner, and more of checking out new, soy-free meat substitutes. My delicious smoothie bowl with fresh fruit and flax meal sprinkled on top! Breakfast one day: yummy almond butter muffins! Soy-free anything can be hard to find, and while I am just as fond of tofu as the next vegan, I am sensitive to it and also believe it’s not always the best for the body. Because of this, in my house we are always looking for great soy-free options or recipes. Below is a simple dinner I made this week: rice with butternut squash, mixed salad greens and avocado, and the most delicious plant-based burgers I’ve ever had…Beyond Meat brand! Wowza! Another night, I made homemade avocado rolls and veggie ramen (below). This was not a soy-free meal, but that’s what being flexible means…especially when you’re tired and need an easy dinner option. The journey of becoming plant-based has become one of the smartest decisions I’ve ever made. I‘m convinced that, along with yoga, it has given me a newfound respect for my body and health. Today, so many people are juice fasting, intermittent fasting, cleansing, and using many other forms of detoxing to get their body healthier. Truth is, you talk to any elder in your family and they will assure you that they ate tons of fruits and veggies growing up. Often times, they ate raw fruits and veggies more than cooked. This is not to say that meat wasn’t part of the picture or that it’s bad to eat meat. I just know that consuming more plant-based, non-animal products has made my body far happier. This week, I enjoyed one of my recent favs—apple cider vinegar detox. It's made using apple cider vinegar, lemon juice, cinnamon, a little maple syrup, and water to taste. It's like apple pie with a bite (and P.S., Ladies, it does the trick for cramps, too!)! 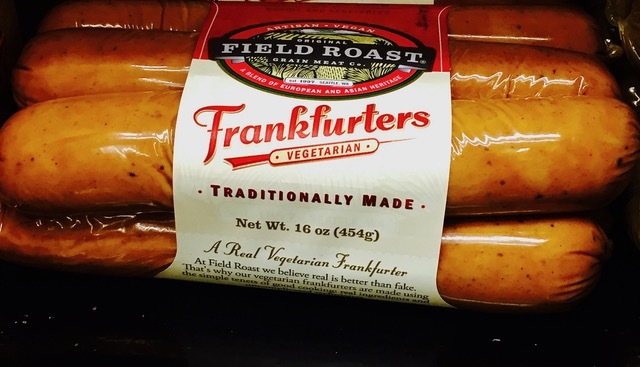 For National Hot Dog Day, we found some vegan and soy-free frankfurters by Field Roast brand. Delicious!—especially paired with braised cabbage and carrots. Another one of my favorites from this week was the awesome sandwich below—fakin’ BLT made with tempeh and a little aquafaba mayo, just for decadence. In the end, a good week, month, or 90-day plant-based detox diet could truly be life changing; there are so many health benefits packed into those daily doses of vitamins and minerals! When I began my vegan journey, after only the first 2 weeks I already noticed I had no more chronic back pain and I felt an incredible surge in my overall energy. More than anything, it’s about what makes your body happy. What makes your body thrive? What kind of fuel makes your whole self its most efficient and productive? Everyone is different. We all have different needs and opinions. If you think about it, having more fruits and vegetables are an option for everyone, and this option has never done more harm than good (just saying!). I hope this post inspires us all to continue to make healthy choices, take care of ourselves, and give earthy-energy a VIP seat in our lifestyles! What would taking a break from meat or other animal products look like for you? I would love to hear your comments about experiences you’ve had or things you'd like to try! Leave a comment below with your feedback and check out the recipe for veggies and "dumplings," as promised. In a large cast iron skillet or Dutch oven, melt the butter over medium heat. Add the onion, bell pepper (if desired), and celery and cook until softened—about 4 minutes. Add the flour and cook, stirring consistently, to remove the flour taste—about 1 minute. Slowly add the broth, stirring constantly, and bring to a boil. Stir in the frozen peas and carrots*. Reduce the heat and simmer the mixture until it thickens slightly—5 to 7 minutes. In a large mixing bowl, whisk together the flour, cornmeal, baking powder, salt, garlic powder, onion powder, sage, thyme, and pepper. Cut in the butter using a pastry cutter or two table knives until the mixture forms coarse, pea-sized granules. Stir in ¾ cup of the milk until the batter is thick and slightly sticky, adding more if needed. If the batter is too dry, add more milk—1 tablespoon at a time; if the batter is too wet, add more flour—1 tablespoon at a time. Drop heaping spoonfuls of the batter on top of the Veggies mixture. Cover and simmer until the dumplings are cooked through—about 10 to 15 minutes, depending on the size of the dumplings. Serve the Veggies in a bowl with a “Dumpling” on top. Enjoy! All of the starred (*) vegetables can be subbed for frozen veggies, which makes the job that much faster and easier! Hello, no chopping—yes, please! Also, feel free to swap different veggies into the recipe in place of the ones in the recipe. As you can see in the pictures above, I used cauliflower and broccoli in the Dutch oven version. Prep time—15 minutes; cook time—30 minutes.